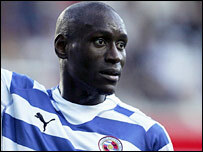 Reading defender Ibrahima Sonko has been ruled out for the rest of the season with a knee ligament injury. The 26-year-old centre-back suffered the injury when he fell awkwardly during the Royals' 3-1 victory over Sheffield United on 20 January. Reading boss Steve Coppell told the club's website: "We will be missing Sonko for the rest of the season. "He is an important player for us but the signings we've made recently will help to compensate for his absence." Coppell has signed defenders Michael Duberry, Greg Halford and Alan Bennett this month.